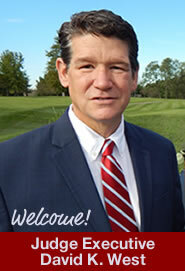 Tim Vaughan is a long-time resident of Jessamine County and is currently a bank loan officer. Tim is a graduate of Asbury College with a degree in Philosophy and Economics. Tim assists in overseeing matters before the Court involving the Jessamine Detention Center, the County Building Committee, and the County E-911 Committee. He is actve in the community in the High Bridge Park & Festival Committee and the Wilmore Community Development Board. Tim is a graduate of Leadership Jessamine County, Leadership Central Kentucky and the Nicholasville Citizens Police Academy, and is an active member of Church of the Savior on Brannon Road. Recent accomplishments on the Court include his sponsorship of the successfully passed Jessamine County Noise Control Ordinance seeking to protect citizens from excessive nighttime animal noise. Tim secured a $30,000 state Transportation grant for the construction of a guard rail on Lock 7 Road in High Bridge. The guard rail will protect motorists and school buses on this narrow road which lays several hundred feet above the KY River. He has also secured funds for a county fire station station adjacent to the former Ichthus property (US 68) which was completed in 2006. The fire station services southwest Jessamine County. Tim may be contacted by email at tvaughan@jessamineco.com or by phone at 859-327-0085 or by mail at the Jessamine County Courthouse, 101 North Main Street, Nicholasville, KY 40356. 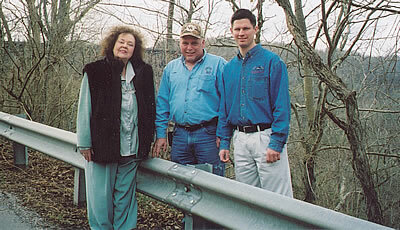 Wilmore matriarch Margaret Morgan and County Road Supervisor Coleman Tudor join Tim to admire the much-appreciated guard rail on Lock 7 Road that Tim secured funds for.